Jazz Piano Solos Series Volume 48. Composed by Irving Berlin. Jazz Piano Solos. Jazz, Standards. Softcover. 96 pages. Published by Hal Leonard (HL.197873). ISBN 1495075699. 9x12 inches. Jazz Piano Solos Series. 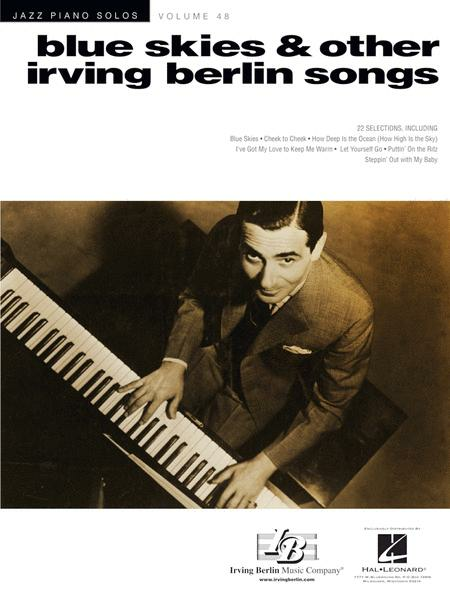 22 jazzy arrangements of Irving Berlin gems, including: All by Myself • Be Careful, It's My Heart • Blue Skies • Cheek to Cheek • How Deep Is the Ocean (How High Is the Sky) • I've Got My Love to Keep Me Warm • It's a Lovely Day Today • Let Yourself Go • Let's Face the Music and Dance • Puttin' on the Ritz • Say It with Music • Steppin' Out with My Baby • They Say It's Wonderful • What'll I Do? • (I Wonder Why?) You're Just in Love • and more.